Though the title might remind you of the popular Game of Thrones series, especially since dragons are a huge part of it, this is actually a slot machine with a very Chinese theme. 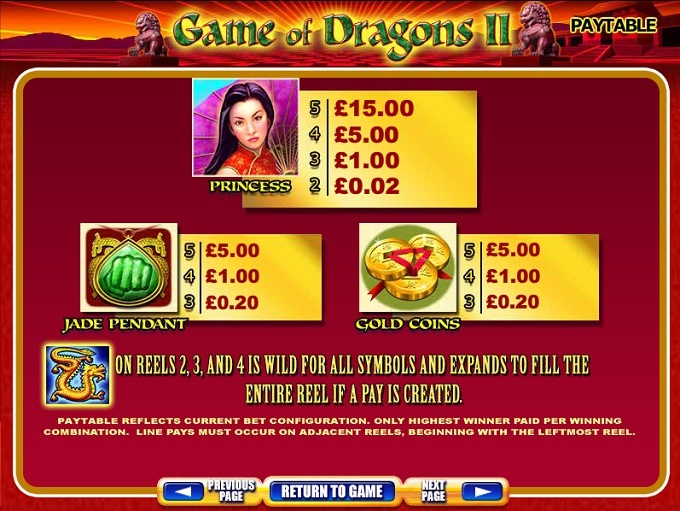 Game of Dragons II gives you many of the usual images that similar slot machines offer, but some new ones are part of it as well. Mostly, it shows off various animals and birds which live in China, but are not necessarily exclusive to that part of the world. 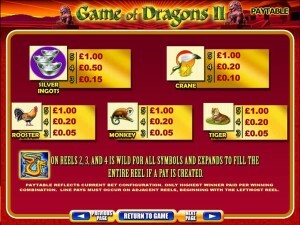 5 reels, 30 paylines and a collection of features which gives you scatter symbols, free spins and wilds. 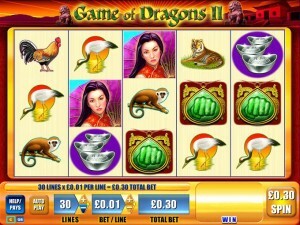 All in all, it looks like a rather average slot machine, and a lot of WMS slots are much more different from the norm. The top payout that it can offer you goes up to $7,500. The reels of the game are quite generous with their features, even though you don’t get a lot of variety. It relies on three types of features, two of which are symbols. You have a wild that can expand here, a scatter symbol, and the usual round of free spins. Let’s take a look at the expanding wild first, for which the game uses a Golden Dragon. You will get it only on the reels 2, 3 and 4, which is the downside to it, since it’s not offered everywhere. However, whenever it can be part of a new paying combo, it will expand and the entire reel will be covered by it. It can substitute for any symbol, even for the scatter. Scatters are represented by Treasure Chests here, and you need them to appear in random positions, but on adjacent reels. 3 or more Treasure Chests will bring you payouts worth from 2x to 50x the wager. To get into the free spins, you will need for 3+ scatters to appear, the same ones that give you cash prizes. You are offered 8 free spins if this happens. Wild symbols can substitute for scatters, each expanded symbol counting as one Treasure Chest. Retriggering the 8 free spins is possible, with another 3+ symbols. Since there are 30 paylines, like most WMS games it will need you to use the same number of coins to cover them all. Each of the 30 coins has a betting range between $0.01 and $5, allowing you to bet up to $150 per round. The Princess symbol is going to pay the most if you get a combo with her, up to 1,500x the line bet, which here would be $7,500. 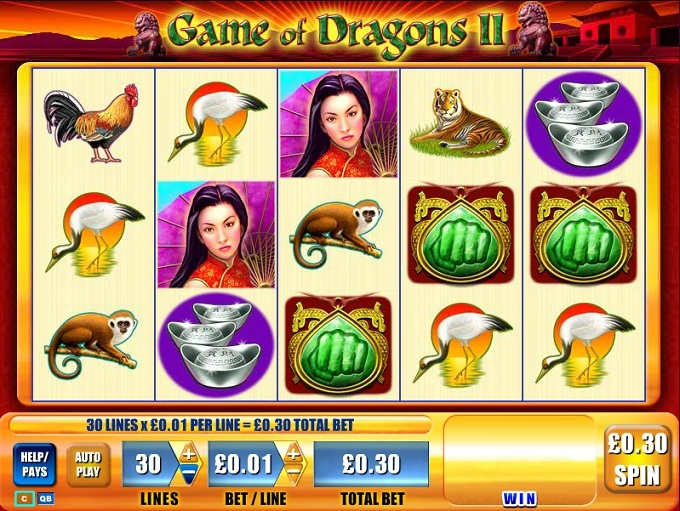 The design of Game of Dragons II is very pretty, and it shows off many Chinese symbols, along with various wildlife examples from that country. There isn’t that much connection with the dragon theme, but a couple of symbols are indeed designed with inspiration from it. The quality of the symbols is one of the game’s biggest advantages here. Symbols: Golden Dragon (wild), Treasure Chest (scatter, 50x total bet), Princess (1,500 coins), Jade Pendant (500 coins), Gold Coins (500 coins), Silver Ingots (100 coins), Crane (100 coins), Rooster (100 coins), Monkey (100 coins) and Tiger (100 coins). It’s one of the many games that come with the same theme, so I’d recommend it for the graphics quality, but not for the features or the payouts, which are average compared with the other titles. This Game of Dragons II slot is offered by all online casinos with WMS software, playable either in practice or in real money mode.